The French Matra team have had one of the most spectacular and rapid rises to fame and success of any racing marque. The firm started life as aeronautical engine builders, then moved into rockets and space research but in 1964 they purchased the Rene Bonnet racing team and began developing their own single-seater cars. Soon their Formula 3 cars were ruling the roost and an enlarged Formula 2 car proved just as successful, precipitating a natural move towards Formula I and Group 6 racing. Just as Matra were contemplating the costly move into Formula I the French Government, after much deliberation, offered Matra a huge loan in order to build an all-French Formula I contender and a Group 6 car to win Le Mans. Although they have failed to win either a Championship Grand Prix or a Manufacturers Sports/Prototype Championship race the cars are becoming more and more competitive and the Formula I chassis powered by a Ford V8 engine gave Jackie Stewart his fantastic string of 1969 victories. one car powered by their own V I 2 engine and much to everyone's surprise this car gradually moved up the field until it was dicing for second place; unfortunately the car ran over some debris from a crashed car, received a puncture and also developed an electrical fire and retired out on the circuit. This near success inspired the team to take Prototype racing more seriously for 1969 and since the single-seater car had not been too successful they decided to leave Ken Tyrrell's Ford-engined Formula I car to tackle the World Championship and develop the heavy and rather thirsty Matra engine for sports car racing with the whole effort aimed towards Le Mans which must still be the most prestigious race in the world. The team sent a brand new M630 coupe to the Daytona 24-hours in February for HenriPescarolo and Johnny Servoz-Gavin but 'Pepsi Cola' lost control of the car in practice and the car was too badly damaged to take part in the race. The next appearance put in by Matra was at the traditional April test day at Le Mans when they appeared with a car called the 630/650. This had the older space frame chassis of the 630 and the 4IObhp Matra VI2 engine but the coupe body had been replaced with a new open glassfibre body coupled with a rear mounted aerofoil to improve stability. During the tests the car went well and Servoz-Gavin recorded second fastest practice time. Considerable development subsequently went into 630/650, the project engineer Bernard Boyer redesigning the 630 chassis to lighten it and improve the suspension' so that later in the season the open car was simply known as the 650. 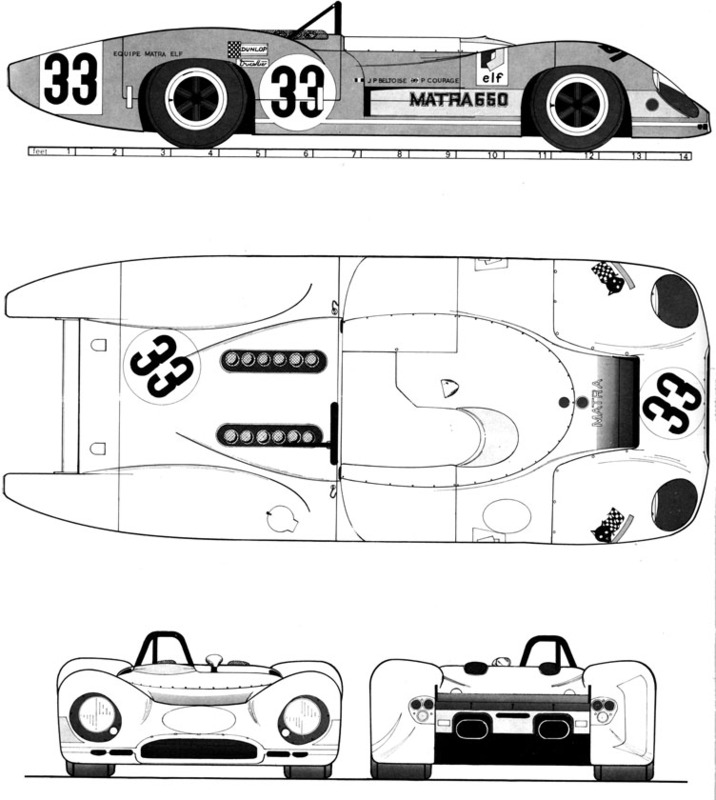 At the same time as the 630/650 was being developed another Matra engineer, Choulet was developing the M640 which, although using a multi-tubular steel chassis, was rather more revolutionary, being designed on more aerodynamic lines for high top speed at Le Mans. The car was kept as low as possible, the front coil spring/damper units being placed horizontally and the big VI2 engine mounted extremely low in the chassis. Reminiscent of earlier Alpine and CD designs, with large tail fins, the prototype 640 was being given private tests on the Mulsanne straight in April 1969 when the car suddenly looped the loop while Henri Pescarolo was driving and crashed badly, the driver being put out of racing for some time with burns. This gave the Matra team a severe setback while they investigated the causes of the disaster and they eventually decided to shelve the 640 at least temporarily and concentrate on the 650. They next appeared at the Monza 1000 Kms with the 630/650 open car, got up to fourth place but retired with engine trouble. The Spa 1000 Kms came next but the team had to scratch their two entries because of a fire in their engine test house. From then on until June all the efforts of the team were concentrated on victory at Le Mans, but setbacks in the shape of another crash during private testing and the banning of aerofoils by the CSI gave the team a lot of trouble and they arrived at Le Mans with a mixed bag of cars although all were powered by the VI2 Matra engine and using ZF five-speed all synchromesh gearboxes. Of the four cars, one was a new open 650 with suspension derived from that of the MS80 Formula I car, two were open 630/650s, and the fourth the same 1968 coupe which went so well in the previous year's Le Mans race. Outclassed on sheer speed by the Porsche 917s and 908s the team decided to try and run smoothly at set average speeds and hoped to outlast the opposition. They almost succeeded in this because the Porsches began to drop out one by one and the Matras moved up, although hampered by their too frequent stops for fuel. But they had reckoned without the Ford GT 40s of the J.W. team and had to be content with fourth, fifth and seventh places, the 650 handled by Beltoise and Courage taking fourth place, the old 630 of Guichet and Vaccarella in fifth place and one of the 630/650S driven by Widdows/Galli in seventh place, the other 630/650 driven by Servoz-Gavin and Muller retiring with electrical troubles. After this satisfying if not entirely successful race the 650 and one of the 630/650S went to the Watkins Glen 6-hour race in the USA where Pedro Rodriguez and Johnny Servoz-Gavin drove the 650 into a fine fourth place after a long pit stop dropped them to twenty-second place early in the race, when a stop for a fuel pump change cost them nearly half an hour. In the final race of the Championship series, the Austrian GP, the single Matra entry led at one stage but was crashed by Servoz-Gavin when he accidentally switched off the ignition.